By the incredible Magnum Psyche and out of the Afire Bey V mare Mystic Mounbey, this 1998 bay gelding has been shown successfully in-hand, as a Country English Pleasure horse and now, as a hunter. Psychic Moun was a U.S. National Top Ten in the Arabian Gelding In-Hand Championships in 2002. In 2004, he was Region 18 Country English Pleasure Champion. 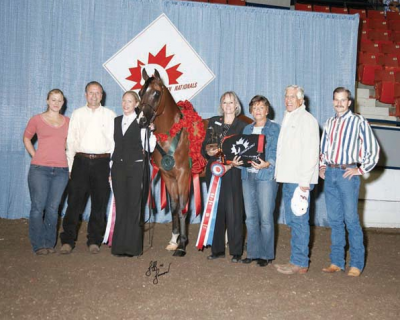 His career in-hand continued, with regional titles as well as a Canadian championship and reserve and a U.S. National Top Ten. Following his 2006 year, Psychic Moun began to be successfully shown as a hunter, a division he continues to be shown in today along with being shown in-hand.